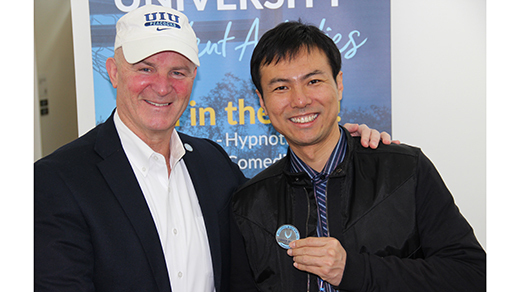 As part of UIU’s new American College Experience Program, UIU President William R. Duffy joined the University's Center for International Education, and faculty, staff and students in welcoming 19 students and two chaperones from Shijiazhuang (China) No. 42 Middle School to Fayette Campus this past weekend. The Upper Iowa University Center for International Education welcomed 19 students and two chaperones from Shijiazhuang (China) No. 42 Middle School to Fayette Campus late Friday, February 8, as part of UIU’s new American College Experience Program. The purpose of the program is to provide the visiting students a taste of an American university experience as well as exposure to UIU. The visiting students and their chaperones will participate in various UIU and area community activities and events before their scheduled Monday, February 18, departure. UIU hopes that this will be the start of a continuing partnership with the students’ schools in China. This program is entirely self-funded by the visiting group.